Tell Me When It's Over is an interview series in which we ask former athletes about the moment they knew their playing days were over. Today: George Lynch, all-purpose star for the University of North Carolina. George Lynch was a 1989 McDonald's All-American at Virginia's Flint Hill School before playing four years at North Carolina. 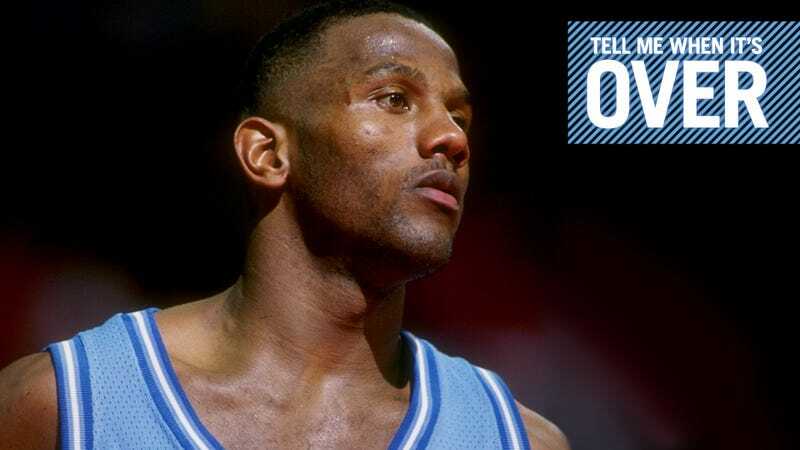 In 1993, his senior season, the Tar Heels won the national championship with a 77-71 victory over Michigan, a game many remember for future NBA Rookie of the Year Chris Webber calling for a timeout that his team did not possess. In that game, Lynch scored 12 points and pulled down 10 rebounds. He was named to the All-Tournament team, and two months later the Los Angeles Lakers made him the 12th overall pick in that year's NBA draft. Lynch's NBA career lasted 12 seasons across four different franchises—the Lakers, Grizzlies, 76ers and Hornets—in five different cities. His played his last game on April 10, 2005 for the New Orleans Hornets who lost at home, by eight, to Portland. Lynch played 11 minutes, going 0 for 2 from the field with three rebounds, one assist and one steal. The Hornets completed their season 10 days later, losing their ninth game in a row to finish the year 18-64. After retirement Lynch took a year off, then worked as a volunteer coach at SMU under fellow former Tar Heel Matt Doherty. Lynch is currently a strength and conditioning coach at the University of California-Irvine. I definitely wanted to be a professional athlete. I didn't know which sport. I just knew I wanted to play. I wanted to stay outside and play sports all day. I always wanted to be the Charles Barkley or Dr. J. And then as a high school player I followed Len Bias. I set my goals pretty high. And I had some great coaches along the way that taught me the fundamentals. I've always said, If you have fundamentals, you can play with anybody. And it carried on into Carolina. Coach Smith stressed fundamentals the most. When I watch college games today, I'm not only looking at the guys scoring 20 and 15. I'm looking to see if they box out every time, if they're helping their teammates defensively. You'd be surprised how many programs that don't teach that. And kids, you know, they're losing games and you're trying to explain to them why, and it's the little things that make the good teams great and the bad teams good. Once they learn the fundamentals, I think kids can play with anybody because you can neutralize the athletic ability. The championship was one of the most memorable turning points. You know, you work hard for four years. You make that commitment to Carolina to play in a Final Four or win a national championship, and for all the hard work to pay off it was an enjoyable moment and a great ride. I mean, the whole experience of the NCAA tournament, to see each college, each university come, their fans come and show their support, I think it's basketball in its purest form. Not playing for contracts. You're just playing for tradition and a lot of pride. I think a lot of times some of those guys get drafted off of a tournament and some of the scouts don't take in your body of work. And then some of those guys don't stay in school long enough to really learn the fundamentals to stick around on an NBA team. Because it's totally different. It's not like you're choosing to go to that team. That team drafts you and expects you to perform every night. And I think what happens with a lot of guys, they don't learn, because they were superstars for one or two years when they came. They didn't have to come off the bench, be a role player, take less of a role, and they don't know how to handle it. There are only 60 possessions in an NBA game, and if you're playing with Allen Iverson, he's taking anywhere from 20 to 30 shots a game. So there are other parts of the game that you have to contribute to stick around. Them guys being young, they don't understand that part of the game. I woke up one morning and I had plantar fasciitis. And that's probably one of the—that was the worst injury that I've had. It kind of lingered on for 18 months, and I was never able to get over it. I had plantar fasciitis in both feet, so I couldn't really train to play at the level I was playing. You could still play, but it took longer. Everything. It took longer to get warmed up. If you sat down for five minutes it was worse than when you started, so it kept you from training. And when your feet hurt, your back hurts, your knees hurt. Everything hurts when your feet start to bother you. So I was never able to train like I was training to continue to play. Because I played the 2, 3, 4, and the 5 at certain points in my career, I had to be in tip-top shape to do the things that I was doing. And when you have that plantar fasciitis you can't get up in the mornings and train like you want to. My last year with the Hornets was actually, really, a disappointment. And then you start to get involved in—teams towards the end of your career, they try to throw you in trades, and you've got family and you've got to decide if you want to move your kids and drag them around the last few years. No athlete ever thinks that his career is going to end. You kind of know it's going to end one day, in the back of your head, but when Father Time hits, it's not expected. I don't know one athlete who knew when he was going to retire. So, it's just one of those things that happens that you kind of can't prepare for. I was battling it. I felt it coming and I couldn't get control of it and, I probably should've just sat down a few games until it healed, but being an athlete, you want to be competitive. You want to be out there helping your teammates, so you try to play on it. And it lingers. And they say that, Well, sometimes if it pops it's better than trying to have surgery. I was hoping that it would pop and be over with, but it never happened. And at that time I wasn't performing the way I was capable of performing and you just have to, you call it quits after that. I didn't know it was my last game. It just happened. Byron Scott was coaching the Hornets my last year there, and I wasn't able to perform for him the way I was capable of performing a year before. I was pretty much healthy other than the plantar fasciitis. And I was honest with myself. I mean, if you can't go out there and perform... I wasn't upset about it. I just wasn't able to train and do the things that I was doing in the off-season to prepare myself to play at a high level. I think it's your decision to quit, sometimes, but it's not your decision where you play and the type of people you're around and who you're playing. Or the coach you're playing for. It's not like college where you get recruited by the guys, and some of them are going to be there for three years, some of them are going to be for four, some might even be for two, but you choose the university and you choose the coach you want to play for. In the NBA, the coaches change and the players change and the team changes, so it's totally different. And I came from North Carolina, so my first time hearing someone cuss out a coach is when I got to the league [laughs]. It was culture shock for me when I got to the NBA, leaving North Carolina. I took some time off. I've got three little ones, and spent some time with my younger kids, being home. My oldest son was able to experience the NBA life. My little girl, who is 8 now, she was 2, so she really didn't know what was going on. And so I volunteered with SMU. At that time I really wasn't ready to step away from the family. I was doing a lot of stuff in Dallas with the youth, camps and skills clinics and stuff like that. I had an attachment to the kids and the parents, and it was one of those situations where I kind of had to hand them off to the right people before I could really commit to SMU. And so I took a year off after volunteering for SMU, but I knew I really wanted to coach. I was trying to get back into the college game. I want to coach at the college level. It's hard, because sometimes they think, being a former pro, you don't want to put the time in. But I try to tell a lot of these coaches that I was one of those pros that did all the dirty work. I was never, you know, a prima donna. Yeah, I was an All-American, played at North Carolina, won a national championship, but I was one of those guys that sacrificed for the team. That's what you've got to try and sell to a lot of these college programs. I think there's a lot of guys out there that played in the NBA who are willing to do what it takes to share the knowledge that they learned from all the experience and playing time that they had, and all the coaches, and give back to these younger kids. Sometimes you've got to get a break and someone has to give you an opportunity. I was fortunate enough, a guy that I played high school ball with, Russell Turner who's the head coach at UC-Irvine, you know, he gave me an opportunity. You know, Matt [Doherty] gave me an opportunity. I volunteered. And now my second opportunity is with UC-Irvine and I'm just trying to make the best of it. I really don't care about being a head coach. I want to be on the bench. I want to teach. I want to be able to share. Because I think the skills that Coach Smith taught me and the skills that I learned from my high school coaches, the work ethic, I think a lot of kids miss that, are missing that in today's game. And the ones that do figure it out are successful and have great college careers. But there are a lot of guys that don't understand what the coach is asking for and what the team needs. And that's what I see when I'm watching kids play. If they come off the floor and they've got a certain attitude. They don't understand why the coach pulls them out. I can help explain what the coach is looking for. You know, maybe what you should've done instead of the decision you made. So I think they understand that coming from a guy who played at the high level that I played at, and they're willing to accept it if someone like myself says, Yeah, the coach is right. You were wrong. You're constantly thinking about what's good for you. What are you good at? That's one of the things I learned: what comes naturally. Like being on the basketball court, in the gym with the guys, to me it's not work. It's not work. It's just something I enjoy doing, so it's a natural transition for me. Some guys do TV commentating. I'd just rather be on the floor with the guys teaching and sharing some of the knowledge that I learned along my career. I went through the withdrawal. Any time I was on the court, any time I'd go in the weight room and train or work out, I'd feel... Even today I feel like I can go get a 10-day somewhere [laughs]. So the withdrawal is still there. You never lose that confidence thinking that you can play. If I was to go play pickup with guys in the gym, the first couple of days I knew I wasn't ready, but once I was able to get up and down the floor, you know, I'm smart enough to be able to play the game. You're still always like, Man, I can go get me a 10-day right now. But to play at that level, the professional level, those guys are really great athletes and well-tuned, in shape. Great bodies nowadays. So it's very hard to go out there and compete at that level. Last year Rob Trucks interviewed current and former D-I basketball coaches Jay Wright, Mike Adras, Charles E. Ramsey, Murry Bartow, and Kevin Stallings as part of his oral history of 49-year-olds. His other work for Deadspin includes interviews with former NHL goalie Clint Malarchuk and the late Dave Duerson, and an oral history of Big Star co-founder Alex Chilton's time in Tuscaloosa. You may e-mail him at trucks@deadspin.com or follow him on Twitter at @tusktusktusk. Theme music and video courtesy Steve Wynn.